The poster "GPU - based Pedestrian Detection for Autonomous Driving" is a pedestrian detector based on the vision to be used in autonomous driving has been awarded as the best poster of the GTC (GPU Technology Conference) 2016. 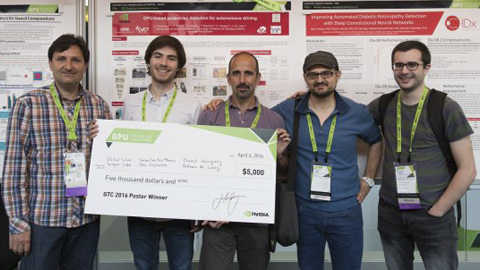 The students Victor Campmany and Sergio Silva, with the help of a team of teachers of the department of computer science and Computer Vision Center, were the winners of this contest. -GEM3: CPU-GPU Heterogeneous DNA Sequence Alignment for Scalable Read Sizes. Alejandro Chacon. GPU Technology Conference 2016. San Jose. California. -Real-time 3D Reconstruction for Autonomous Driving through Semi-Global Matching. GPU Technology Conference 2016. San Jose, California. D. Hernandez-Juarez, A. Chacon, A. Espinosa, D. Vazquez, J. C. Moure, and A. M. Lopez. -Beyond Standards: A New GPU-Aware Image Coding System. Pablo Enfedaque. GPU Technology Conference 2016. San Jose, California.